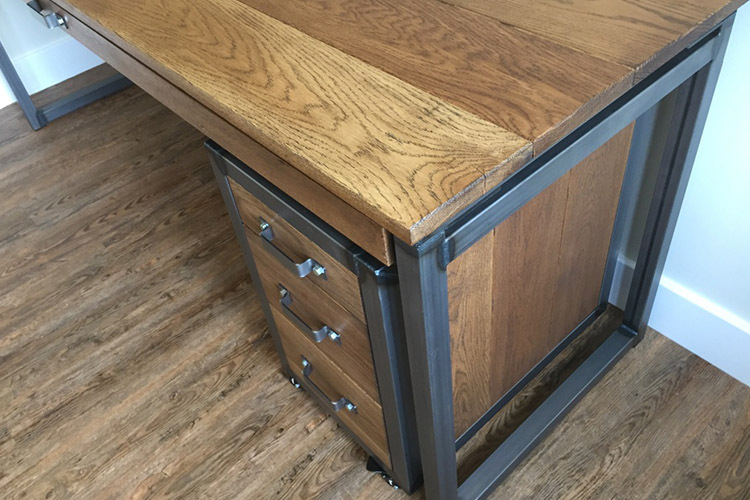 In a recent project we have combined an industrial desk with drawers. This shows 2 of our furniture pieces including the Remington desk with full length drawer together with the Milena storage unit. In this project we used box mild steel size used was 40mm in thickness. Plastic insert bungs are used on the bottom of the feet to protect the floor from steel damage. The welds on the steel have been left visible to give that vintage industrial finish. The drawer runners on the desk and drawer unit are silver soft close which adds the nice finish to the frame. The steel frame was made detachable which enabled us to build the desk on the 2nd floor to our clients property. The Milena unit stays as a solid unit and was simply carried by the couriers into position. For this desk the client went with solid oak planks. After the Antique Oak dye was applied to the oak we finished with a hardware oil for protection against water spillage etc. This is done for all of our furniture collection. For both pieces we added matching mild steel handles. The measurements for the compartments inside the full length drawer can be handmade bespoke. 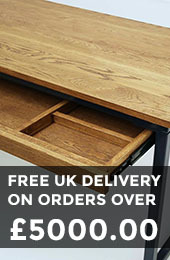 Our delivery team will ensure your industrial desk with drawers are built in the room you desire, all included in our personal courier service. We can also provide you any future oak treatment advice. 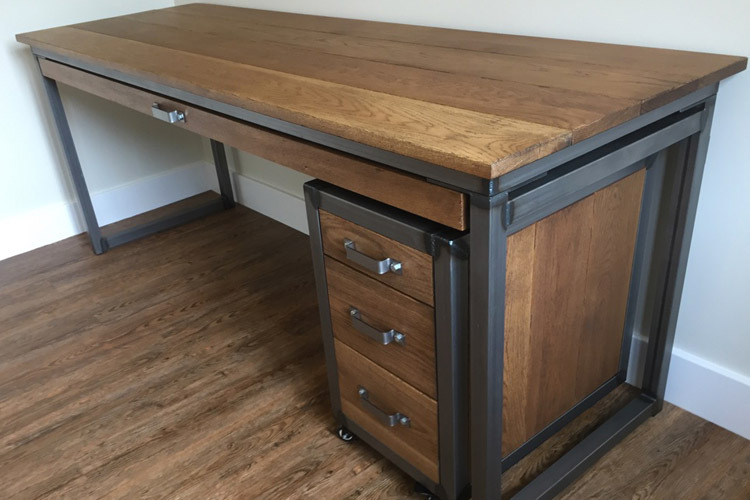 If you would like an industrial desk with drawers similar to this and would like to discuss a project similar to this, please don’t hesitate to contact us today. Whilst your online, take a look through our online shop and collections and see if there is anything else that may inspire you. It’s also great to view our oak and steel options to get an idea of the choices available to you. You can order samples online if you wish to see the wood and metal options in person.